Compression post-surgical vests ensure the crucial, proper post-surgery care following plastic-aesthetic interventions. They speed the healing process along and, due to their anti-bacterial effects, eliminate the growth of bacteria. They also reduce pain, minimize swelling and bruises and reduce the risk of infection. The final result of a surgery depends on the proper compression therapy as much as the surgical intervention itself. 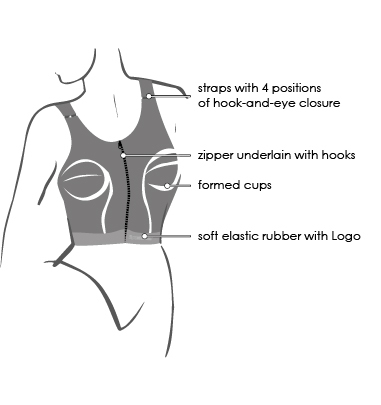 Compression post-surgical body suits ensure the crucial, proper post-surgery care following plastic-aesthetic interventions. They speed the healing process along and, due to their anti-bacterial effects, eliminate the growth of bacteria. They also reduce pain, minimize swelling and bruises and reduce the risk of infection. The final result of a surgery depends on the proper compression therapy as much as the surgical intervention itself. 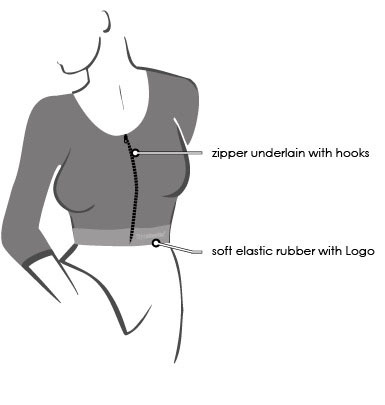 Trouser leg bottom is closed only with zippers.